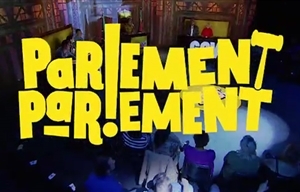 Parlement, Parlement is a South African, Afrikaans-language comedy panel show in which comedians take over "parliament" to discuss the issues that really matter to ordinary people. The show aims to be a place where you can laugh with the politicians and not just at them. Parlement, Parlement is a format created and produced by Both Worlds. The executive producer is Thierry Cassuto and the supervising producer for kykNET is Marguerite Albrecht. Karen Jeynes is a producer and the head writer. Other writers on the series include Louw Venter, Sergio Pieterse, Marion Holm, Anne Hirsch and Margit Meyer-Rödenbeck. Original music is by Gerhard Grobler and Both Worlds Music.